Martinique is like a tropical France, a warm island of little French villages. 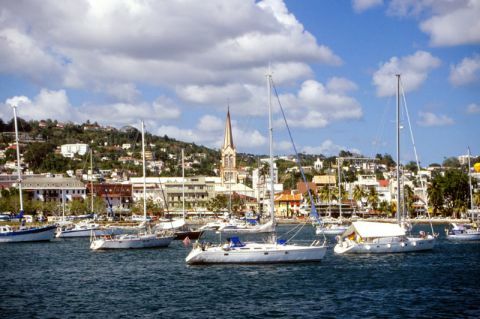 It lies between Dominica and St. Lucia about halfway down the Lesser Antilles island chain. The Atlantic Ocean is on the east, the Caribbean Sea on the west. There are mountains, rainforest, exotic flowers, and black and white beaches. Martinique is largely agricultural; the first settlers established sugar plantations, and sugar cane continues to be an important crop. Rum is widely produced and exported; bananas and pineapples are grown here as well. Les Salines, the Southern beach near Sainte-Anne, a charming French village in the tropics, is simply one of the most beautiful beaches in the world. By Sylvie Bigar, Contributor. Forbes. Monday, 1 Oct 2018 10:16:00 -0400. Borrowing from its mother country, this French Caribbean island offers French cheeses, Parisian fashions, and colonial architecture in the capital, Fort-de-France. Along with the city's many stores, you'll want to visit the Schoelcher Library and the Saint-Louis Cathedral. A range of lodging options are available, from inexpensive inns to large luxury resorts, and restaurants serve both Creole and classical French cuisines. Some knowledge in the French language or a French phrase book will help you communicate with many of the local people and workers. In 1902, the now-dormant volcano Mount Pelée erupted onto the city of St. Pierre, killing about 30,000 people. Many travellers visit the Museum of Volcanology or hike up to the volcano's crater rim. Martinique also made its mark in history when Napoleon Bonaparte married islander Empress Josephine. In 1887, the French impressionist painter Paul Gauguin visited Martinique. Two of his noted paintings, Vegetation Tropicale and Bord de Mer I, were painted on Martinique.